I believe true beauty is more than a good makeup job. That’s why I’m in Skincare – To help my clients have a healthy complexion, so they leave feeling beautiful! Facials Santa Monica, LightStim® LED technology leaves skin firmer, tighter and smoother.I believe good skin is the best foundation. After more than a decade working as a makeup artist for top line brands, Laura Mercier and Chanel, and freelancing as a makeup artist for weddings, photo shoots, and films, I realized that the key to helping my clients look their best was to help them get a healthy complexion. I’ve dedicated my career since to offering personalized skincare treatments to help my clients dramatically improve the condition of their skin. Through signature solutions and personalized guidance on the best products and lifestyle choices, I promise to guide you to your most beautiful skin. Quick and effective 30 minute treatment to detox, cleanse, exfoliated and hydrate. Perfect 60 min treatment to deep detox, cleanse and exfoliate , including a peel, 1 booster of Dermabuilder (great for fine lines and wrinkles) or Britenol (great for pigmentation) plus a LightStim® LED treatment. A awesome 60 min treatment to deep detox, cleanse and exfoliate , including a peel, 1 booster of Growth Factor, (great for fine lines and wrinkles) plus a LightStim® LED treatment. The HydraFacial is an all in one inclusive treatment that de-clogs, de-greases, peels and purifies the skin for instantly glowing skin, without harm, irritation or downtime. Yes, you can go back to your activities right after! This treatment is the evolution of traditional facials, using technology to bring about lasting and immediate change to the skin. Pores are deep cleaned to perfection and your skin will get a whole new world of glow. Also great for men, mom’s and teens! The unique Vortex-Fusion® Serum Delivery System is what sets the HydraFacial MD® apart from other procedures. The multi-step treatment cleanses, evenly exfoliates and extracts to remove impurities and dead skin cells while at the same time replenishing vital nutrients including Antioxidants, Peptides and Hyaluronic Acid. Thanks to the devices’ superior delivery system, these performing ingredients are able to more effectively help mitigate environmental damage, reduce fine lines & wrinkles, and plump & firm skin for long-term results you can see and feel instantly. This revolutionary skin resurfacing technology is perfect for all ethnicities and skin types, and patients can immediately return to normal activities with clean, radiant skin. 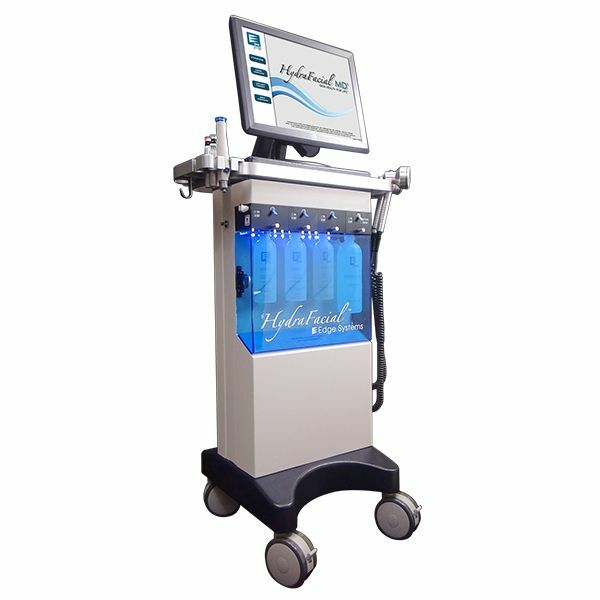 It’s all in the technology that is patented by HydraFacial. A special “vortex-fusion” set of tips are what draw out impurities, exfoliate the skin and deeply infuse nourishing serums. First, the skin is cleansed and degreased. The vortex tips drives in lactic acid and algae extract to unclog pores and draw out impurities. This process is safe enough to not provide any downtime, but effective enough to really get in and deep clean. The second step is to apply a medical grade peel of glycolic and salicylic acids to gently remove dead, dull skin cells. This powerful exfoliation leaves your skin brighter, softer and noticeably improved. This is followed by the patented vortex vacuum extractions which deeply unclogs pores without pinching and redness typical with extractions from traditional “old school facials” . Yes, with Hydrafacial you can get deep pore unclogging without redness, marks or dark spots! This makes this the ideal option for those with sensitive skin. Lastly is the infusion of powerful antioxidant serums and peptides. Before you walk out your skin is prepped with a hydrating moisturizer and SPF. You are able to go back to work right after your treatment. Peels are safe for all skin types, and as a PCA Certified Professional I am trained to identify what treatment combination is safe for each person’s skin in order for patients to reap the greatest benefits. Professional peels are increasingly effective with pre- and post-treatment care, balancing your skin before the peel and nurturing it after the treatment. Using PCA SKIN’s daily care products in the WEEKS BEFORE your professional treatment is an important step in preparing your skin and ensuring excellent results. Skin that is balanced and healthy will help reduce the risk of complications and typically lead to better treatment results.Equally as important, post-treatment products are designed to be used after a chemical peel or other minimally invasive professional treatments to minimize the potential for uncommon side effects. In preparation for your treatment, I will evaluate your skin to determine the most effective combination of daily care products for you. Daily Care. Along with receiving regular treatments from a clinician, a daily care regimen is critical to achieving and maintaining optimal skin health. IS Clinical® active treatment is designed to rapidly and safely resurface the skin, reducing fine lines and wrinkles, smoothing, softening and encouraging cellular renewal. Treatment ends with LightStim® LED technology leaves skin firmer, tighter and smoother. Perfect for dry and dehydrated skin. This luxurious, exfoliating, hydrating facial treatment enhances skin with gentle massage and soothing hydration. Treatment ends with LightStim® LED light therapy leaving skin smoother and softer. A treatment designed for brown spots, sun spots and discoloration. A synergistic blend of powerful ingredients helps to brighten and balance dull and uneven skin tone. 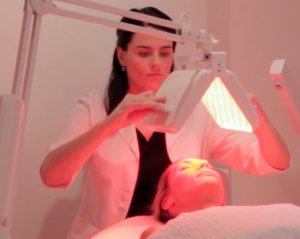 Treatment finishes with optional LightStim® LED light therapy. The perfect solution for skin that is experiencing clogged pores, eruptions and imbalances. This purifying treatment will address even the most oily and blemish prone skin. This Facial finishes with optional LightStim® LED light therapy which helps destroy acne-causing bacteria to minimize future breakouts. Great for manly men, this treatment is deep cleansing, exfoliating and hydrating. Followed by optional LightStim® LED light therapy leaving the skin firmer, tighter and smoother. For those aged 12-17, this customized facial treatment will target any concerns. Acne, dehydration or simple relaxation. Also included is a full skin care consultation stressing the importance of using the appropriate skin care products. This purifying facial treatment for your back is completely customized to your concerns. Whether you have break outs, skin discoloration, or dehydrated skin, your master skin therapist will design a unique service to treat your back!